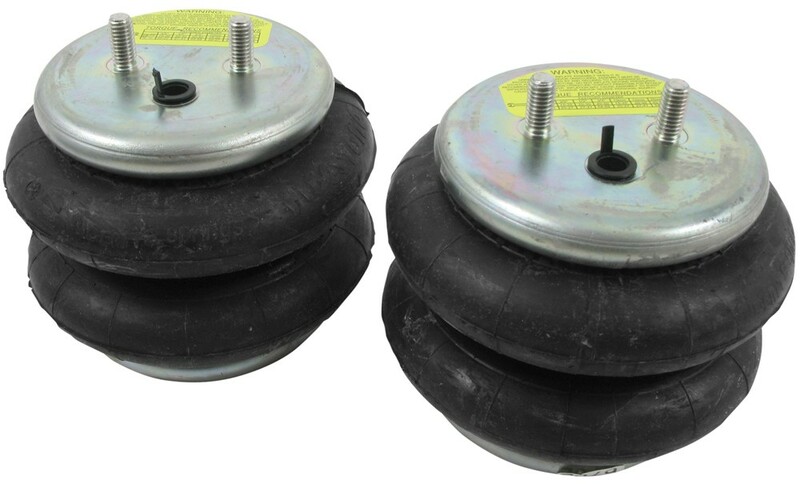 Firestone vehicle suspension for your 1989 Ford F-150, F-250, F-350 are available from etrailer.com. Installation instructions and reviews for your Ford vehicle suspension. Expert service, and cheapest vehicle suspension price guarantee. etrailer.com carries a complete line of Firestone products. 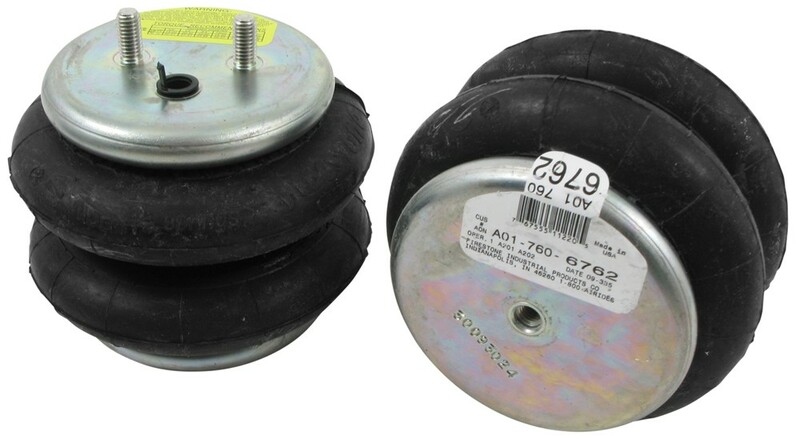 Order your Firestone Ride-Rite Air Helper Springs - Double Convoluted - Front Axle part number F2223 online at etrailer.com or call 800-298-8924 for expert service. 3,200-lb Capacity. Ride-Rite air springs enhance your factory suspension for safety and stability when you are pushing a plow. They reduce strain on your front axle, keep your Ford F-150, F-250, F-350 level, and adjust to load size for a consistently smooth ride. Ride-Rite springs will not increase your vehicle's weight-carrying capacity. Do not exceed the manufacturer's recommended weight limit. Firestone Ride-Rite springs are designed to increase safety and reduce the strain on your vehicle when you are pushing a plow or hauling a heavy, front-mounted load such as a large grille. The springs partner with your existing front suspension system to help keep your vehicle level, maintain even load distribution and increase stability. Hauling heavy loads or pushing a plow can make the front of your vehicle sag and the rear end rise. This puts more strain on your front axle and reduces contact between your rear tires and the road, causing problems with braking, steering control and traction. By adding air springs to your front suspension, you can help to level your vehicle and improve braking and handling. The air springs also help to level your headlight beams and reduce wear on your tires. The air pressure in your Ride-Rite springs can be adjusted manually, side to side, to compensate for off-center loads. A centered load improves the stability of your vehicle by reducing body roll. The air springs will also help to absorb road shock and to soften contact between your axle and frame. This prevents bottoming out, thus improving ride comfort. 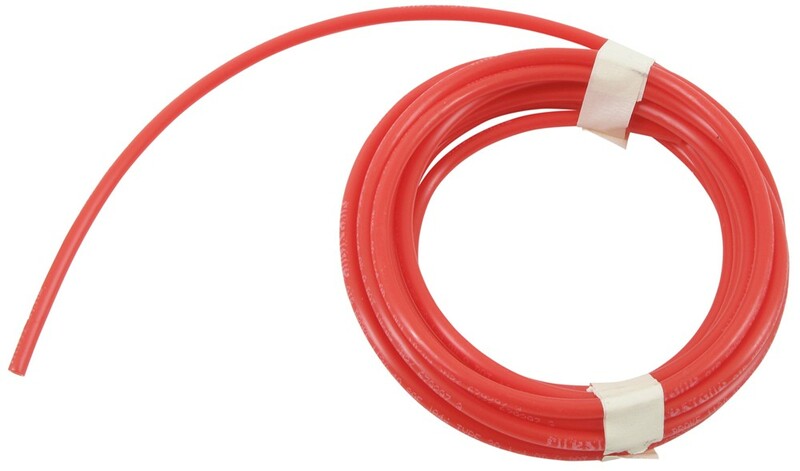 Route the air line tubing for the springs to your vehicle's bumper to provide easy access to the manual inflation valves. Firestone's double-convoluted Ride-Rite air springs are designed to give you maximum load support and enhance the performance and ride comfort of your vehicle. The rubber springs provide cushioning between your suspension components and operate at up to 100 psi. The springs have four layers of reinforced rubber to ensure durability and enhance load support. A braided wire girdle creates the double-convoluted shape of each air spring, increasing the burst pressure of the spring. The rubber springs are attached to corrosion-resistant metal end plates with a time-proven, rolled crimp seal that keeps the bags securely anchored. Each Ride-Rite kit includes custom-fit brackets that connect to your axle and frame. 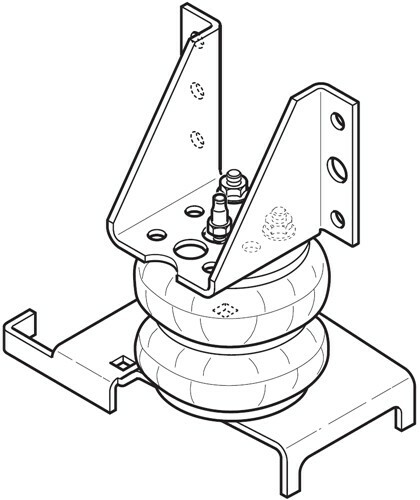 The brackets provide the mounting points for the air springs. Drilling may be required for some applications. Order: RelevanceNewestRating - High to LowRating - Low to High 3,200-lb Capacity. Ride-Rite air springs enhance your factory suspension for safety and stability when you are pushing a plow. They reduce strain on your front axle, keep your vehicle level, and adjust to load size for a consistently smooth ride. Had these on for a year. Working GREAT. One of the best things we put on the truck to haul our camper. Would buy again. Really happy with them. Working great! Added an on-board compressor to the unit and use it to tow Travel Trailer. Does not get a LOT of use, but when it does, its great! Weve made multiple trips with my rear axle carrying a considerable load. The air bags work great and Id highly recommend them to anybody. I wont tow our trailer without air bags. They make a world of difference with respect to control and stability. I have zero issues with this air bag system since I bought it a year ago. The air fittings are of good quality and hold pressure with no leakage. 100 satisfied with this system. Sloppy packing job caused no problems. Air springs are working as designed. Thanks for the follow up. Thanks for the follow up David. I would like to caution you that this air bag kit is not intended to increase the hauling capacity of your truck. Please make sure that you are within the towing capacities of your truck. I spoke with my contact over at Roadmaster Active Suspension. He said not to use it on front leaf springs because there are so many other moving parts at the front end and they do not test them or rate them for use at the front. If your truck is 4-wheel drive there is another option for adjustable suspension enhancement. You could use Firestone air bags # F2223. It also costs less that the active suspension system. The Ford 7.3 liter Powerstroke Diesel is a V8 and not a V10 so Firestone Ride-Rite kit # F2550 will fit your truck. I have included a link to a video showing an example installation of these air bags for you to view. For Firestone Ride-Rite kit # F2550, it will fit a 2002 Ford F-350 with 4-wheel drive, or a 2-wheel drive model as long as the 2-wheel drive model is not a SuperCab with a V10 motor and 8 foot bed. 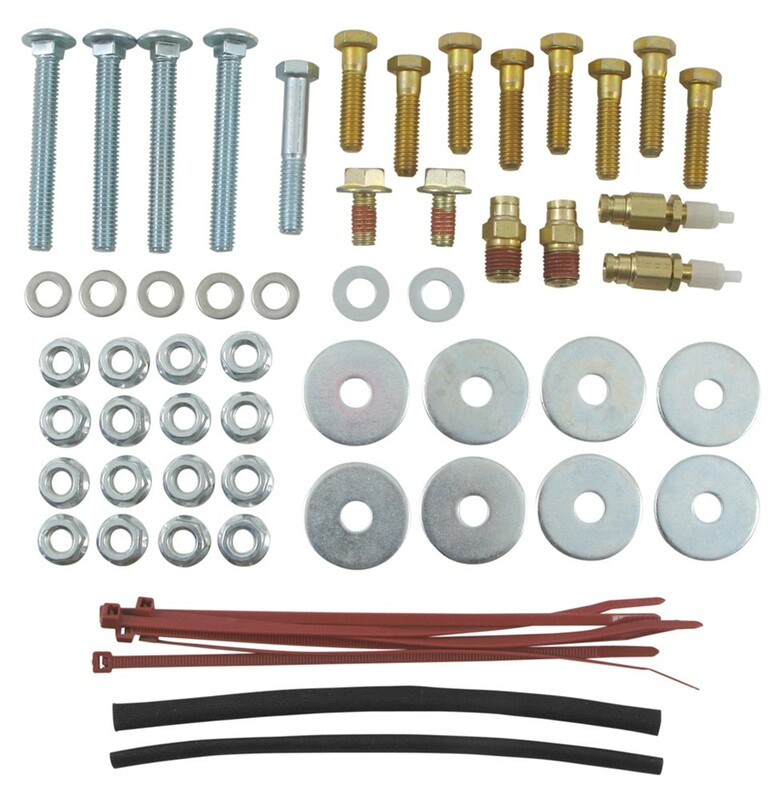 If you have a 5th wheel or gooseneck trailer hitch installed, this is the kit you would want. Ride-Rite kit # F2223 is for the front axle, not the rear. I also recommend Level Command kit # F2158 which will allow you to add or remove air from the air bags from the comfort of your truck cab.